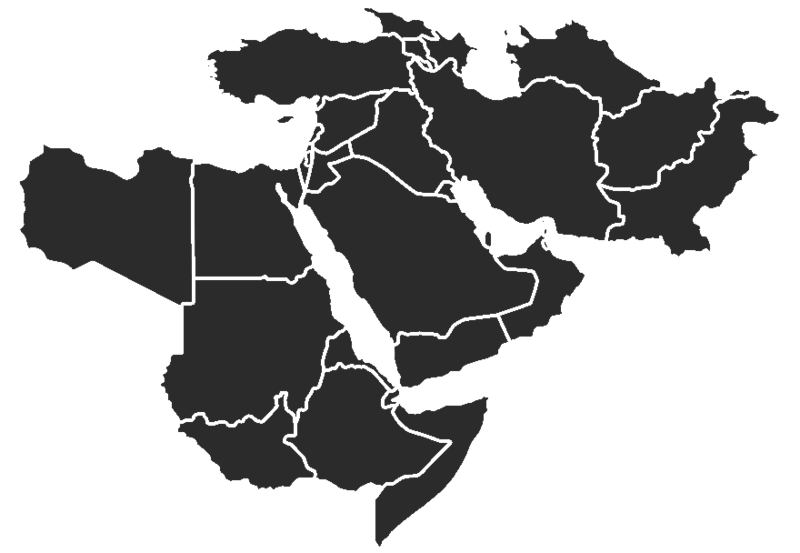 Islamic State in Iraq and al Sham (ISIS) militants carried out their fifth, and possibly sixth, bombings targeting the al Houthis since the start of the Islamic holy month of Ramadan. The attacks indicate ISIS may have started a Ramadan offensive in Yemen against the al Houthis. ISIS militants appear to be carrying out a Ramadan vehicle-borne improvised explosive device (VBIED) campaign against the al Houthis in order to inflame sectarian tensions within the country. ISIS Wilayat Sana’a militants detonated a VBIED targeting al Houthis at a mosque in central Sana’a, on June 20. 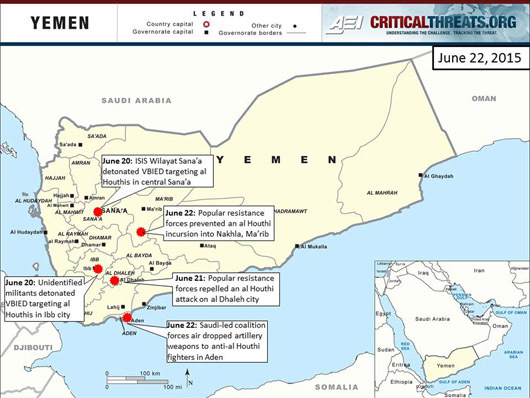 The June 20 attack may be an attempt to sustain a campaign against the al Houthis that began with the June 17 quadruple VBIED attack in Sana’a. It is not clear whether pro-ISIS groups in Yemen will also participate in the campaign or whether it will be limited to the environs of Sana’a. Unidentified militants also detonated a VBIED in Ibb city, Ibb, on June 20. The attack in Ibb targeted an al Houthi gathering, making it possible the attack was carried out by ISIS militants. A pro-ISIS Twitter account claimed ISIS militants were responsible for the attack, although al Qaeda in the Arabian Peninsula (AQAP) also targets al Houthis using VBIEDs. UN-led political talks in Geneva ended without a ceasefire agreement. Political talks between the al Houthis and Abdu Rabbu Mansour Hadi’s government ended on June 19 without a ceasefire agreement and no date set for future talks. UN Special Envoy to Yemen Ismail Ould Sheikh Ahmed stated that a ceasefire agreement would need to be reached before another round of political talks. The UN also stated that $1.6 billion in humanitarian aid was needed in Yemen. Saudi Arabia continued heavy airstrikes targeting al Houthis throughout Yemen following the collapse of the political talks. A single-sourced report states that a new movement in Najran, Saudi Arabia, seized control of a Saudi military base in the area. Fars News Agency quoted Saudi political activist Abu Bakr Abu Ahmed al Salami stating that activists in Najran had formed a movement called “Ahrar al Najran” [Free Najran] in order to combat the Saudi regime on June 17. English-language Iranian press and al Houthi-controlled media picked up the report on June 20 and claimed the group had seized a Saudi military base in southern Najran. They also cited a statement issued last week from the tribes, which cannot be confirmed. Saudi media, which is highly censored, has not reported on Ahrar al Najran. Ahrar al Najran’s existence, if true, would be an indicator that the Yemen conflict is encouraging Saudi citizens from minority populations to mobilize against the Saudi government. It is also possible Iranian media is attempting to foment instability within Saudi Arabia among the small Zaydi Shia Yemeni tribal population, whose territory spans the Saudi Arabian-Yemeni border, in Najran. Anti-al Houthi popular resistance forces are making limited gains against the al Houthis, indicating the al Houthis may be struggling to retain control of territory in south-central Yemen. 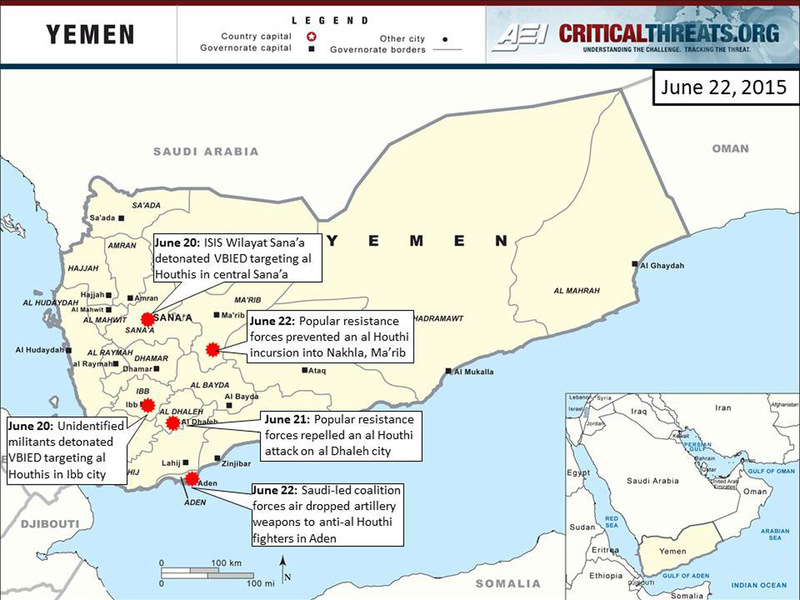 Anti-al Houthi forces continue to control the southern city of al Dhaleh after seizing it from the al Houthis on May 24 and repelling an al Houthi attack on the city on June 21. The al Houthis have also not been able to gain a strong foothold in Ma’rib. Popular resistance forces repelled an al Houthi attack in the Nakhla region of Ma’rib, central Yemen, on June 22. Separately, Saudi Arabia-led coalition forces reportedly air dropped artillery weapons on June 22 to anti-al Houthi forces in Aden, southern Yemen, where popular resistance forces continue to battle al Houthis for control of the city. The al Houthis also continue to attack Saudi targets using artillery fire along the Saudi-Yemeni border in Jizan province and have claimed to have shot down an American unmanned aerial vehicle (UAV) in Sa’ada, northern Yemen, on June 21. The collapse of UN political talks in Geneva, though unsurprising, signifies that neither side of the current conflict is willing to compromise in order to reach a ceasefire agreement. Continued ISIS attacks will likely elicit a strong military reaction from the al Houthis and will further undermine ongoing attempts to get the al Houthis to relinquish control of some territory.